Students in French Club created hallway decorations for the International Week celebrations. Photo by Mike McKay. Editor’s Note: This is the eighth in a series of International Week stories about ethnic clubs to highlight the diversity of Niles West. 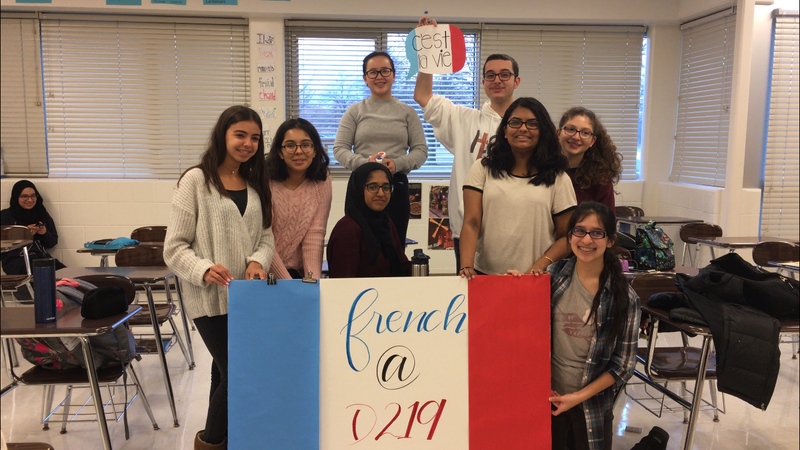 As one of the top ten spoken languages in the world, French classes enjoy immense popularity at Niles West; likewise, French Club is one of the most popular cultural clubs at Niles West. The club gives French students an extra opportunity to expand their knowledge of the language and culture. “It’s a great experience to learn about French culture and language because the teacher tells us stuff in class, and if we have questions at the end of class, going to French Club helps us learn more,” senior Edita Mackic said. In the past, French Club has actively participated in International Week by making crepes for the International Feast and decorating the hallway with French decorations. Unfortunately, they did not have enough students to perform the Can Can dance at International Night this year. However, that hasn’t stopped French Club from pursuing other activities. The club regularly plays French games, bakes pastries, and explores more aspects of the French and Francophone cultures.